She's Fantastic: My Favorite WONDER WOMAN! It's been a few years since I've purchased a new Wonder Woman and I'm going to make a ballsy statement that the DC Direct JLA Boxset figure is the best one out there. I love this figure for so many different reasons. She looks so strong, yet not manly. She has a great face that I think really captures the look of a modern Greek Goddess. Her colors are bright and classic. And her body pose is a standard straight-forward stance - not the exaggerated contraposto or stylized "Birth of Venus" pose we often see with collectors market females. My only real gripe about this figure is the lasso. DC Direct really needs to get on the ball and stop including crappy half-assed accessories. The only high point is that you can buy a spool of the stuff at ACMoore for a nickel and replace it in a jiffy if need be. This figure is an amalgamation of two previous Dianas. Her body comes from the Justice League of America Series 3 figure (Based on the art of Ed Benes) from Jan 2009. And her head comes from the unreleased All-Star Wonder Woman figure (Based on the art of Adam Hughes - from the never-released All-Star WW comic). This prototype was first shown around Jan 2008. The combined version of the two figures was released in Dec 2009. While both of these figures are perfectly good designs, they each have issues (in my humble opinion). The head on the Benes version has odd hair and the face sculpt only vaguely resembles Benes' art. Conversely, the body on the Hughes version is awkwardly posed with limited range of motion. I personally would not have purchased either of these figures. Time for some comparisons! The Dodson-style Wonder Woman Series 1 action figure from DC Direct (Dec 2007) is a easily a second runner-up. She's beautiful, she has great hair, she looks powerful, and she poses well. She was my favorite for two whole years! If forced to compare though, I would say that her colors fall a little flat, her face looks beautiful, but not exactly "Amazon Warrior Goddess", and her body doesn't have that blend of femininity and strength I associate with the character. 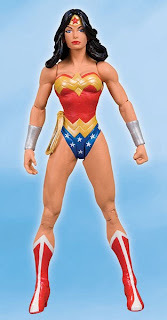 Mattel DC Universe Classics Wonder Woman was a major disappointment for me. The prototype shown at conventions was stunning and the idea of a superposeable figure was very exciting. But the final in-store product fell flat in my eyes. She looked gangly, the thigh-joints were distracting (and highlighted different colored fleshtone plastics), mine had tons of seam tags from poor casting (especially at the shoulders), and her face looked smooshed with some serious duckface action. All in all though, she's still a decent representation of Wonder Woman and was probably one of the most accessible versions for many collectors so she's definitely worthy of a comparison. Her sculpted lasso is a definitely improvement over an unravelling piece of craft string! I made a lot of comments about the INSANE amount of Wonder Woman figures out there. If you're interested, check out ExperienceTheWonder.com which is the best resource for Wonder Woman collectibles. He has an awe-inspiring collection and a fantastically designed page... brings a tear to my eye. have to admit that new wonder woman figure finaly nails her right since the one thing that is hard with wonder woman is capturing her in plastic including her face for some of the early figures look make her look more slutty. plus reason wonder woman is the most merchised famale is because dc really other then batgirl really do not give their females the same push as bats and supes. ever since I mentioned that she is the most merchandised female, I've been thinking about other characters that are also heavily promoted. I think 2nd place would be Catwoman, and 3rd would be Invisible Woman. Then maybe Characters like Scarlett from GIJoe or Princess Leia from Star War. I feel like I should do some real research on this and post about it. I have looked EVERYWHERE for this figure! 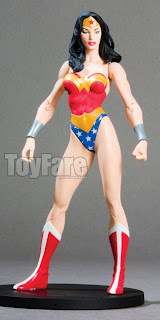 Ebay, Amazon, several toysites... any idea where I might be able to get one of this version of Wonder Woman? You may have to splurge and buy the whole box set, because she's probably pretty rare loose. That's a lot of Wonder Women. Great collection.